Song formatting setting effect the overall drawing of songs. The following preferences provide a number of options for users depending on their locale or playing preference. The following sections are used to adjust various aspects of song formatting. OnSong can be used to manage when a capo should be applied. How that is treated on the display changes depending on user preferences. Chords are handled differently depending on your visual and language preferences. This section allows you to adjust how chords are rendered on the page. Chord diagrams are used to help you learn or remember how to play chord formations on your instrument. ChordPro section directives can be treated differently in the song viewer and you can configure them here. 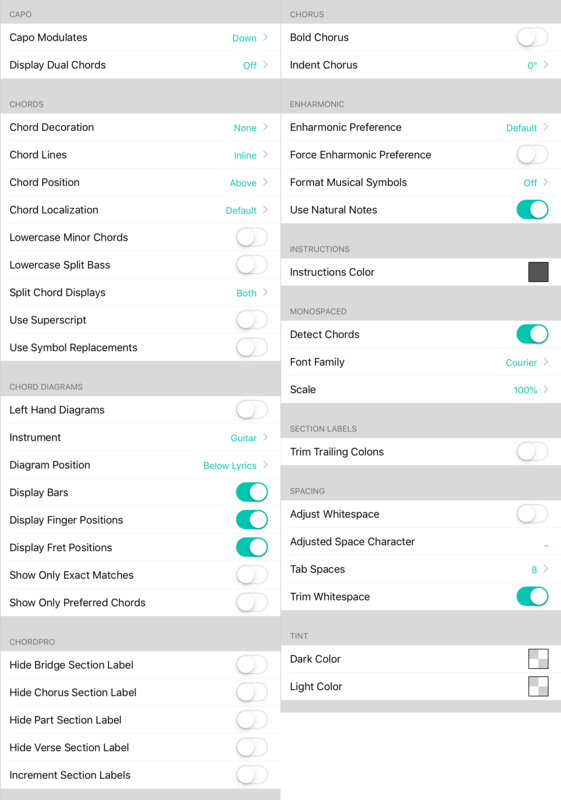 OnSong can recognize chorus sections of your song and render them differently. Enharmonic preferences are used to determine how OnSong handles sharps or flats. Musical instructions are denoted in OnSong with a line of text surrounded by parenthesis. Monospaced content is sometimes displayed in your song such as tablature. You can adjust how that appears using settings in this section. Determine how section labels are rendered in the song viewer. Spacing of chords and other components is important. This section provides configuration to help manage spaces in your document. Chord charts are rendered with black text on a white background. You can also change this to white text on a black background using Low Light Mode. You can tint these colors using these settings.